Once a brand tailored to those who’d rather spend their weekends exploring the great outdoors than bingeing on Netflix, North Face is now creating packs designed for those who only ever hike to work. Its new Access Pack is engineered to safely carry and provide quick access to all of your gadgets. The backpack excels at that—but not much else. When it comes to choosing a pack for carrying all of your work week necessities—think laptops, tablets, smartphones, and a nest of cables—any backpack large enough to handle your computer will suffice. But North Face has incorporated two killer features into its Access Pack that commuters are sure to appreciate: a rigid outer shell, and a large access panel that quickly opens wide at the push of a button. It’s not bullet-proof, but the Access Pack’s hard outer shell does offer extra protection for your electronics. If you drive to work every day, you don’t necessarily have to worry about people banging into your backpack, or having it get caught in a set of closing subway doors. But if you’re dependent on public transit, you’ll immediately see the value in having a little bit of extra armor protecting your gear. That’s not to say North Face’s Access Pack is made from bullet-proof kevlar or titanium plating. The plastic outer shell that’s hidden beneath a layer of padded fabric isn’t going to survive a beating from a baseball bat, but it will go a long way towards protecting your gear while fighting your way onto a crowded subway car. Like a whale swallowing plankton, the Access Pack opens wide for easy packing. The backpack’s other most notable feature is a spring-loaded panel that automatically opens at the push of a button to give complete access to the backpack’s main compartment. When the backpack first arrived at my house, this release mechanism worked just fine, but the fabric on the rear of the pack that needs to fold so the panel can fully open was a little stiff, requiring a bit of time for it to open, almost like it was happening in slow motion. Over time it has loosened up and now opens almost instantaneously, but you might find yourself frustrated for the first little while of using it. Metal good, plastic not so much. I give high marks to The North Face for making the hook that holds the Access Pack’s main panel closed out of metal, there’s little chance it’s ever going to snap off. But then I have to take those high marks away again given the release button, which is exposed all the time, is made of plastic. It hasn’t broken yet, and maybe it never will. But I also feel I need to be a little more careful with it to ensure it stays in working order. A small gap when the Access Pack is closed means it’s not completely waterproof. It’s also important to point out that while the Access Pack’s quick-release panel is far easier to open than a zipper, it’s not waterproof when closed. There’s a gap you can easily squeeze your finger into, which means that when worn in the rain there’s a slight chance moisture is going to find its way into where some of your electronics are stashed. And given the lack of a built-in rain cover, an umbrella is a must-have accessory if you intend to wear the backpack on rainy days. Like to organize your gear? The Access Pack’s got plenty of pockets. Inside the Access Pack’s main compartment you’ll find countless pockets. Some are zippered, some are held shut with elastics, and three of them—designed to hold smartphones and tablets—even feature screen-protecting soft liners and pull tabs for easy access. Retrieving your phone is as easy as pulling on a strap. The three pockets are thin and snug to ensure that anything slid inside them doesn’t come sliding right out again. To make it easy to remove a smartphone or tablet, a simple tug on a rubber strap that works like an eject button causes your device to slide out, without you having to try to cram your fingers in there to retrieve it. I would love to see this feature incorporated into the pockets on pants and jeans too. A dedicated computer pocket can handle laptops up to 15-inches in size, which can be easily removed with a tug on a handle. Behind the Access Pack’s main pop-open compartment is a second smaller section designed to hold a laptop up to 15-inches in size. For added security it seals shut with a zipper so it’s harder for someone else to quickly access what’s inside. But like the gear pockets in the main compartment, there’s a handle that can be pulled that causes your laptop to pop-up for easy access. It’s a feature that should be included on every backpack with a dedicated laptop pocket. A comfy set of shoulder straps makes it easy to haul the heaviest of laptops. So what’s missing? Quite a few things you’d need to use this $235 backpack on anything other than your daily commute to work. There’s no waist straps to help offload the weight from your shoulders onto your hips. There are no external straps or loops for attaching bed rolls or other hanging accessories like a wet umbrella. And the backpack’s hard outer shell means the Access Pack can’t expand when you might need to over-stuff it, like when packing an extra set of carry-on clothes ahead of a flight. It helps keep the overall look of the Access Pack—available in both black and gray color schemes—clean and streamlined, but the most glaring omission is the lack of an external water bottle pocket. Few of us head off on our daily commute without extra hydration on hand should the subway get stalled, but you’ll need to make sure that water bottle is sealed extra tight since it has to be packed inside the Access Pack with all of your electronics which don’t necessarily mix well with H2O. Not a dealbreaker by any means, particularly if you’re a Starbucks addict and instead get your hydration through a cup of coffee. So is the Access Pack right for you? North Face has clearly spent a good amount of time designing a backpack that can safely get your gear to work and back home again, and it will especially appeal to anyone who bounces around a city all day with a nomadic work life. It’s not cheap, though, and the price tag feels even more expensive when you consider the pack isn’t ideal for more rugged activities where North Face’s gear can normally be found. If you never intend to head off into the great outdoors with it, you won’t be disappointed with the Access Pack. But if you need a pack that’s useful for both your weekday and weekend activities, you might want to consider an alternative. North Face’s first backpack dedicated to carrying and protecting your gadgets comes chock fully of pockets inside, and access that make it easy to remove smartphones, tablets, and your laptop with just a tug. Hard shell serves as a layer of armor protecting everything you’re carrying inside from the dangers of commuting. No external water bottle pocket, so you’ll have to make sure that bottle is sealed tight before tossing it in with your gear. A slight gap when the easy-open access panel is closed means water could get inside when the backpack is worn in the rain or bad weather. Hard shell doesn’t expand to accommodate extra gear like a soft-side backpack can, making it hard to over-stuff and use for traveling. 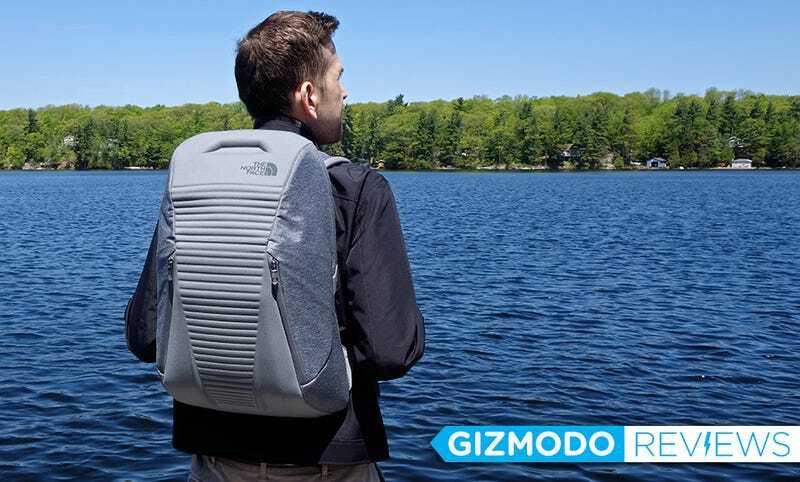 At $235 it will undoubtedly protect your electronics, but some might consider that expensive for a commuter-focused backpack that’s far from ideal for hiking or weekend adventures.